The Air Force Museum of New Zealand is home to a superb collection of military aviation memorabilia, fully restored aircraft, such as the Havilland Vampire, Supermarine Spitfire and P-51 Mustang, to medals and parachute-silk wedding dresses. In February this year the Museum celebrated a major milestone – the official opening by the Governor-General of a $15 million, 6,500m2 extension designed by Warren and Mahoney. 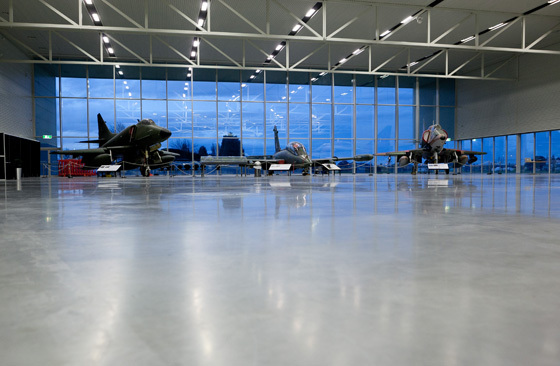 The new ‘Technology Centre’, which effectively doubles the Museum’s original size, includes an elegantly spacious, hangar-styled display gallery, a large restoration area and a number of workshops. BBR Contech was commissioned to install two floors in the Museum. The first was the floor in the display gallery – a 200mm-thick, 4,200m2 expanse of post-tensioned, water-pipe-heated concrete, which was poured in two consecutive days. Created on a gentle slope, the floor has the strength to hold the 130-kilonewton axle load of a Bristol Freighter, with a smooth finish and comfortable ambient temperature to suit the room’s role as a venue for displays and public functions. The second post-tensioned floor, spanning 983m2, was installed in the workshop area. Combined, these two projects have helped the Museum to improve both its public face and the working environment it provides for those responsible for its fascinating restoration projects.